The View tab in the Control Panel of the Predict window allows you to define the displayed tracks and curves. You can also select the displayed depth axis, hide/display annotations and define the default display window and window of interest. You can display the depth axis in project units, international metres or international feet based on your preference. From Insight’s Control Panel, select the View menu, and click Preferences. At Display Units, select your choice of the display unit for depth. Define the minimum-maximum vertical extents for zooming out the display of the processing window for all the wells. By default, this is set from 0 to 10,000 (as indicated by the values on the vertical axis of the Well Navigation Panel). Shallow — Select to use a Constant or a Horizon to define the minimum time extent used to zoom out the display of the processing window. If you are using a horizon, you can optionally input a constant value to offset the horizon. Deep — Select to use a Constant or a Horizon, or both, to define the maximum time extent used to zoom out the display of the processing window. If you are using a horizon, you can optionally input a constant value to offset the horizon. Tip: You can override the default display window settings by defining the display window settings specific for a well in the Well tab (see Overriding the Display Window). The generation of synthetics and filtered results for all the wells is based on the Default Window Of Interest. You can configure the Default Window Of Interest to confine the synthetics and mistie analysis to a specific shallow-to-deep distance/time range. Use Display Window — By default this check box is selected, which means the window of interest will take the same settings as the Default Display Window. To define different extents for the window of interest, clear this check box and the Shallow and Deep fields will be available. Type the values for the window of interest extents as per your requirement. The window of interest extents are indicated by the red lines in the Well Navigation Panel. Shallow — Select to use a Constant or a Horizon to define the minimum time extent to generate the results for the synthetics, export and mistie analysis. If you are using a horizon, you can optionally input a constant value to offset the horizon. Deep — Select to use a Constant or a Horizon to define the maximum time extent to generate the results for the synthetics, export and mistie analysis. If you are using a horizon, you can optionally input a constant value to offset the horizon. Tip: You can override the default window of interest settings by defining the window of interest specific for a well in the Well tab (see Overriding the Window of Interest). This section allows you to display/hide the annotations in the Predict window. Well Markers — Select this check box to display the well markers in the Predict window. Horzn Markers — Select this check box to display the horizon markers in the Predict window. Only horizons that are active will be displayed. Marker Names — Select this check box to display the well marker names to the left of the marker lines. Marker Lines — Select this check box to display the well marker lines across the Well Log Panel and Synthetics-Seismic Panel. Cursor Values — Select this check box to display the well curves and synthetics-seismic values at the current location of the green cursor. The curves values will be updated and displayed at the bottom of the Well Log Panel and Synthetics-Seismic Panel as you move the green cursor along the curves. If you do not see the green cursor in the Synthetics window, press Ctrl+Shift+X. Tip: The green cursor in the Predict window is tied to the green crosshairs in the 3D and section views. As such, as you move the green crosshairs along the well in the 3D or section views, the green cursor in the Predict window will also move accordingly. Well Title — Select this check box to display the well title at the top of the Predict window. Change the colour and thickness of the grid lines by adjusting its Appearance. The opacity can also adjusted by clicking on the colourbar and then the arrow at the bottom (see Opacity). Optionally, select whether to Add Curve Borders and change the colour and thickness of the borders. This section allows you to display/hide the tracks in the Predict window. Green indicates that a track is currently displayed, while amber indicates that the track is disabled and not displayed. To display a specific track, click the amber circle corresponding to the track. The amber circle will turn green. Click the green circle to hide a track that is currently being displayed. The green circle will turn amber. Under the Tracks section, select the check box to automatically determine the min and max values for the track. You can define your own value range by clearing the check box and then typing the value range. The field beside the check box allows you to define the track width (in pixels). A zero value (0) will autofit. This section allows you to display/hide the curves in the Predict window. Green indicates that the curves are currently displayed, while amber indicates that the curves are disabled and not displayed. Under the Title column, click the green circle to hide the curve. The green circle will turn amber. To display a hidden curve, click the amber circle. 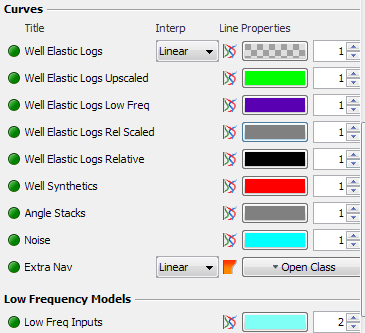 For the Extra Nav and Well Elastic Logs curves, you can select under the Interp column to interpolate the curves in Linear or Nearest method. Under the Line column, you can select to display the curve in line, variable area (line curve filled with colours that represent the data) or variable density (column filled with colours that represent the data). Click the icon under the Line column to change the display of the curves. For a line curve, you can change the line colour, opacity and thickness under the Properties column. Click the colour box and select the colour of your choice. Open the Select Colour window for more colour options and adjust the opacity. The field next to the colour box allows you to type or select the line thickness to use. For a curve displayed in variable area or variable density, you can edit the class settings of the curve to change the colour bar used to display the curve or select the colour bar in the drop-down box. Click the Fill from left or right arrow to display the curve in filled colours from the left or right direction. To do the same for well curves that have been linked to default class settings, go to the Control Panel and open the Class tab to edit the corresponding class settings (see Defining Track View Settings). Alternatively, you can also configure individual track and curve settings by right-clicking on any track and click Configure Track. This will open the Configure Track dialog box. In addition to defining the track and curve settings, you can rename the track titles here. 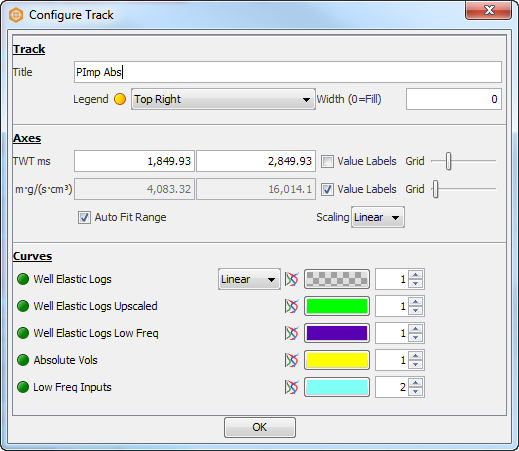 The example shows the Configure Track dialog box when you right-click on the PImp Abs track and click Configure Track. Title — Type the title of the track. Legend — Click on the amber circle to activate legends for your curves and select the location of the legends box on the track. Width — Set the track width in pixels. A zero value (0) will autofit. Y Axis — Type the range of the Y axis values to display the track. In this example, these are the TWT ms values. 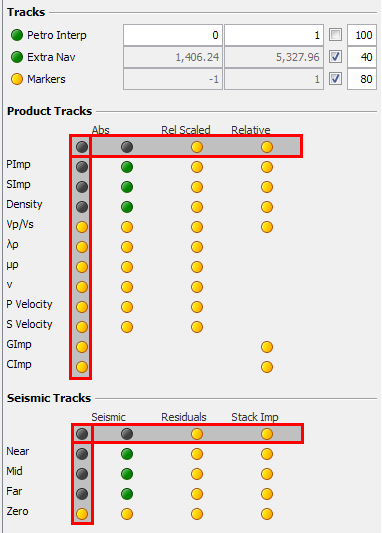 Y Axis Value Labels — Select this check box to display the values for the Y axis of the track. Y Axis Grid — Move slider to the right to increase the number of horizontal grid lines in the track. X Axis — Define the X axis value range for the curves in the track, or select the Auto Fit Range check box to allow Insight to automatically scale the axis. X Axis Value Labels — Select this check box to display the values for the X axis of the track. X Axis Grid — Move slider to the right to increase the number of vertical grid lines in the track. Scaling — Select Linear or Log to display the curves in the track in the linear or log axis space, respectively. You can define the display settings for the curves as described in the "Curves" section.